A generous supply of tissues, soup, and soap. 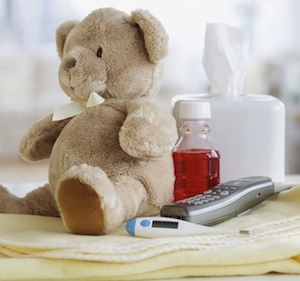 Those are the standards during cold and flu season, but there are a few other items you might find helpful if you have a child who is medically complex. I know, you are all saying, “Um, duh.” But a lot of people don’t realize the importance of having at least 10 bottles of hand sanitizer in your house during cold and flu season. Remember 2009 when you could not even find it on the shelves at the height of the H1N1 epidemic? Stock up. Now. Seriously, though, hand sanitizer should be your best friend this season. Put a bottle in every room. If you are really intense, you can even buy a tabletop touchless dispenser or mount a dispenser to the wall. These days hand sanitizer comes in tons of varieties. You can get “all natural” hand sanitizer, hand sanitizer with aloe and other flavors, little spray bottles, pocket packs with hooks, hand sanitizer foam, and even hand sanitizer wipes. It doesn’t matter what kind you get as long as it is 62% alcohol or more. Avoid all varieties of non-alcohol based hand sanitizers as they may promote antibiotic resistance. Pediatric masks are surprisingly hard to find. I suggest buying a box at the beginning of the season and using one whenever you are at the hospital or in a physician’s office. Those places are germy cesspools. I personally like the Kimberly Clark kids’ masks, which have Disney characters such as Mickey Mouse on them. If you want to get a seriously major mask, 3M makes N95 respirators in a small size that fits some children. If your child does not have a suction machine at home, you are going to be dealing with a lot of snot. I highly recommend having a good bulb syringe at home and consider investing in either a manual or motorized nasal aspirator. Buy a regular bulb syringe—like the blue ones found in hospitals—and not one of the fancy baby ones. The regular kind are cheap and work. You don’t need anything fancy. Manual nasal aspirators may strike you as disgusting, but they really work. Typically, you use the suction of your mouth to aspirate the snot out of your kid’s nose or mouth. Don’t worry, there are filters involved. Nosefrida, also affectionately known as the Snotsucker, is the simplest option out there, but make sure you buy lots of extra filters. 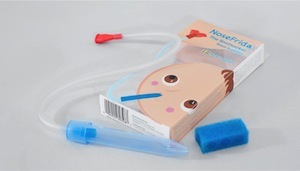 Baby Comfynose is another option that uses tissues as filters, eliminating the need to buy filters. Most brands cost from $5 to $20. Several companies, including Graco and Safety 1st, make inexpensive motorized nasal aspirators. In general, the suction on these is not fabulous, but they do work and are relatively inexpensive at $20-25. They are a good option for someone who cannot stomach the manual suction kind. If you are willing to invest a little bit more, you can buy a hand-powered medical suction pump. Ambu’s Res-Cue Pump is about $50, and other brands run about $35-60. The Laerdal V Vac is slightly more, but a great option for kids who need a little more suction. To help you suction and keep your kid’s nose from getting stuffy, get a good nasal saline preparation. Squirts and sprays are readily available at any pharmacy. Don’t feel like you need to buy a name brand—it is just saline, and saline is saline. For children who can swallow normally and protect their airways, a saline wash or a flush using a Neti pot (make sure you used distilled or sterile water) can help to clear out stuffy noses and sinuses. Call me crazy, but pretty much everybody can use a hand-washing reminder. Get your own at Just Bathrooms Signs. I particularly like the one shown here, available at http://www.justbathroomsigns.com/safety-signs/hand-washing-signs/sku-s-5623.aspx. You can also get a similar graphic at http://www.cafepress.com/peacewings/2127329 in many colors printed on anything from a t-shirt to a hat. Humidifiers continue to be one of the most helpful items during cold and flu season, particularly to assist with comfortable breathing. Hot mist and cool mist humidifiers are readily available in any pharmacy for less than $50, including kid-friendly designs. Despite what you may have heard, hot mist humidifiers do work better. They can be risky, though, because the water is literally boiled inside the machine. If a curious toddler knocks one over, he can be badly burned. In addition, if they are not cleaned rigorously, the hot environment can promote bacteria and mold growth. Don’t buy one unless you can place it in the room safely and are willing to clean it after every use. I recommend using distilled water to cut down on bacteria and mold growth. Cool mist humidifiers often work well for people with asthma and allergies and are much safer for young children. They do require wicks and/or filters, which must be replaced regularly. Cleaning is still necessary, but these types of humidifiers tend to have less bacterial and mold growth. Also, if you have a whole-house humidification system, turn it up! And make sure you change your furnace filters regularly as well. Thermometers are an absolute must, but which one should you buy? Every family should have at least one designated rectal thermometer (electronic is fine) to use when you really need an accurate temperature. Apart from that, it is mostly a matter of preference. If you have kids who can regulate their temperatures and don’t need their temperatures taken often, an inexpensive oral thermometer is all you need. For infants, toddlers, and children who need their temperatures taken frequently, an ear or temporal thermometer is a must. These allow you to take your child’s temperature noninvasively and as frequently as is necessary. I prefer a temporal one for accuracy, but the accuracy depends entirely on your consistent ability to use the thermometer correctly (and it is not as simple as it looks). The best one on the market remains the Exergen TemporalScanner, though new generic models work pretty well, too. I tend to find the ear thermometers a little less reliable, but they are fine if you just need an approximation. The Braun ThermoScan continues to be a highly-rated option, though there are many others available on the market. The most important thing you can do before cold and flu season is be prepared! You never know when a cold or flu is going to strike, so it is best to have all of the above items on hand at all times.